Antoine Lavoisier is deservedly considered one of the great chemists in history. We might not know of his experiments if it weren’t for his wife. She became a remarkable, if unconventional, chemist herself and had one of the weirder lives in history. When Marie-Anne Pierrette Paulze was only 13 years old, she found herself in an awkward position. Her father, a well-off but not particularly powerful financier, was being asked for her hand by a 50-year-old count. It was 1771, and the French nobility had clout. To shore up the family’s future while avoiding marrying his daughter to someone nearly four times her age, her father looked around for another suitor and found it in one of the young men working for him. Antoine Lavoisier was 28 years old, and had excellent prospects. He embraced the scientific curiosity of the age, studying chemistry and performing experiments, but he had secured a practical future as a tax collector for the crown. Marie-Anne liked him, and given her options, chose to become his wife. The marriage was a happy one. Marie-Anne shared her husband’s interest in chemistry, and had a gift when it came to languages. To help with his work, she translated English-language chemistry texts. One of the texts, written by a Richard Kirwen, explained the element of phlogiston, and how it played a part in combustion. Marie-Anne noted the mistakes that Kirwen made, and added her own notes to the translation. This caught Antoine’s attention. He met with other chemists, including Joseph Priestley, who believed that phlogiston had to be eliminated from air in order to let objects combust at maximum efficiency. Antoine performed his own experiments, and zeroed in on the truth—that phlogiston didn’t exist, that air is not one element, but a combination of many, and that oxygen is the only component that allows animals to breathe and fire to burn. It was one of his most famous discoveries. Marie-Anne is part of why it is so famous. Antoine sent out papers willy-nilly, but Marie-Anne organized and clarified them, turning them into Elementary Treatise on Chemistry, one of the most influential chemistry textbooks. She even included her own illustrations. She’d learned to draw from the famous painter, Jacques-Louis David. In addition to teaching Marie-Anne, David had painted the most famous picture of Antoine and Marie-Anne together. He also created the most famous painting of Marat—which shows the revolutionary leader dead in his bathtub after being stabbed by Charlotte Corday. In the painting, Marat is depicted as a noble martyr. In history textbooks, he’s portrayed as a bloodthirsty monster. And unfortunately, Jacques-Louis David was not the only connection between Marat and the Lavoisiers. Before he became a revolutionary monster, Marat was an amateur scientist, and had his theory debunked and his ambitions blocked by Antoine Lavoisier. Once in power, he took revenge.He dissolved the Academy of Sciences. Lavoisier got a show trial and execution. Marie-Anne also spent some time in the clink, but survived the revolution. She married another scientist in 1805. 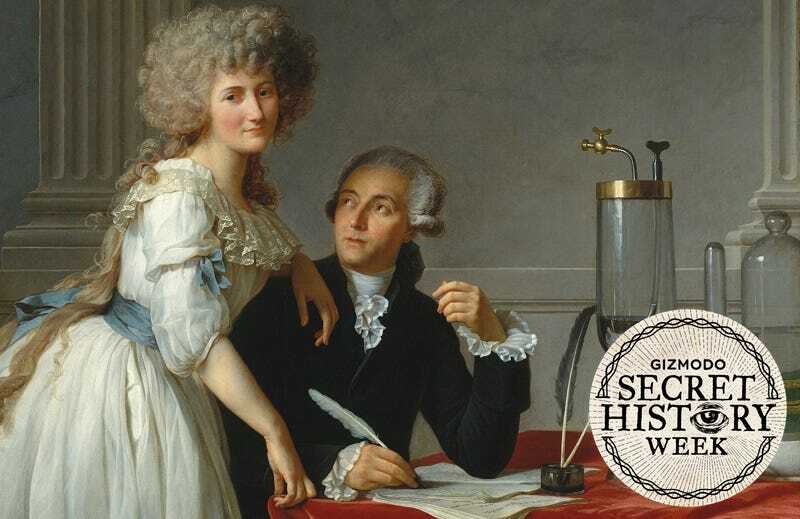 This time the marriage didn’t work out—who could follow Antoine Lavoisier, after all? Marie-Anne died at 78, in her home in Paris.